Cinderella Man will bid to extend his unbeaten streak to five while Gyeongbudaero will look to get back to winning ways when they face off alongside five others in what is set to be the race of the weekend in Korea at Busan on Sunday afternoon. 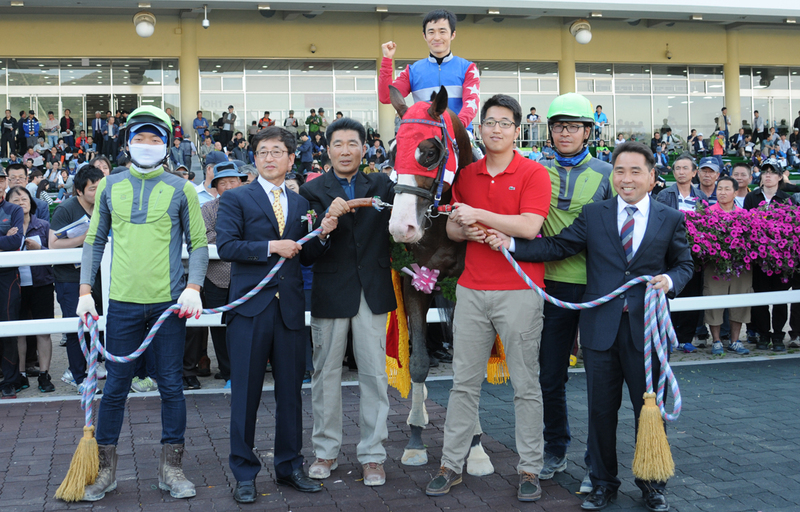 President’s Cup and Grand Prix Stakes champion Gyeongbudaero went down to defeat last month while a week later, Cinderella Man scored his third straight class 1 win and ninth in total from twelve career starts to date. Only seven will run in the feature, which will be over 1800M but it is a star-studded line-up and it’s by no means certain either of those two will win. Gumpo Sky, one of the top three-year-olds of last year will be there as will 2014 Busan Metropolitan Stakes winner Nobody Catch Me as well as prolific winners Spring Gnarly and Useung Radar. The field is rounded out by Cinderella Man’s stablemate Ghost Whisper. The Pegasus Stables owned pair have been prepared for the first time by Bart Rice and it’s set to be a big weekend for the South African trainer. In terms of quality, Seoul is once again overshadowed by Busan. The capital’s feature race of the weekend is also on Sunday afternoon with Heukgisa and Namhae Daewang among the better known names going. There was big race action in both Busan and Seoul this past Sunday and it was Seoul Bullet who produced the performance of the day to down Macheon Bolt and Diferent Dimension to win the Gold Circle Turf Club Trophy and take his unbeaten record to six. In what was a highly-anticipated clash, Peter Wolsley’s highly thought-of pair of Diferent Dimension and Macheon Bolt were sent off as the market favorites, the two three-year-olds having a 5kg weight advantage over the four-year-old Seoul Bullet. In the end, that didn’t count for much as Seoul Bullet swooped home on the outside under in-form jockey Kim Yong Geun for a three-length win over Macheon Bolt and the fast-finishing Diferent Dimension who was suffering his first defeat. Seoul Bullet was sent to Florida in advance of his two-year-old season, racing four times at Gulfstream Park with one third place among them – and managed to get himself claimed along the way. Korean horses who go to the US at a young age generally do very well on their return only to see the advantage they have erode over time. So far Seoul Bullet seems to be getting better and better. 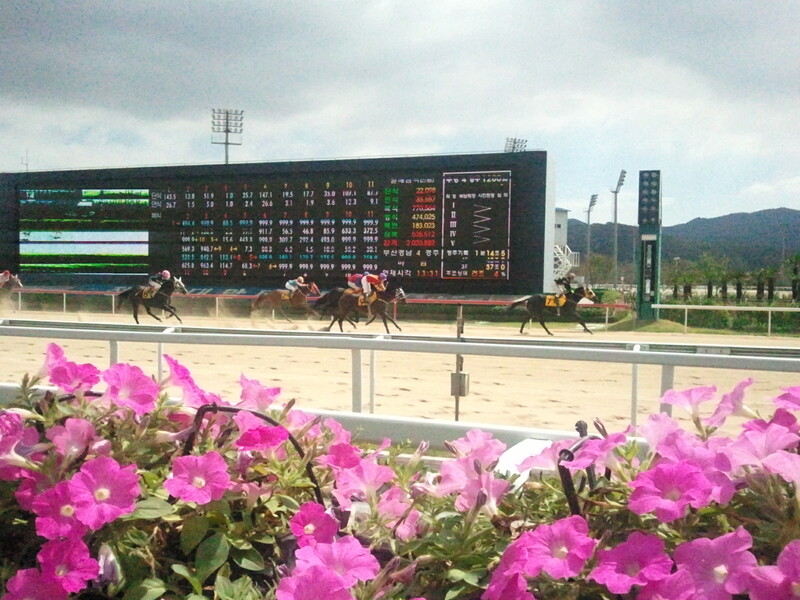 At Seoul on Sunday the feature race was the Herald Business Cup which attracted a full field of fourteen. And at the end of the seven-furlong race it was US import Cheonmang who came out on top, a two-length victor over the similarly named Cheon Gu. 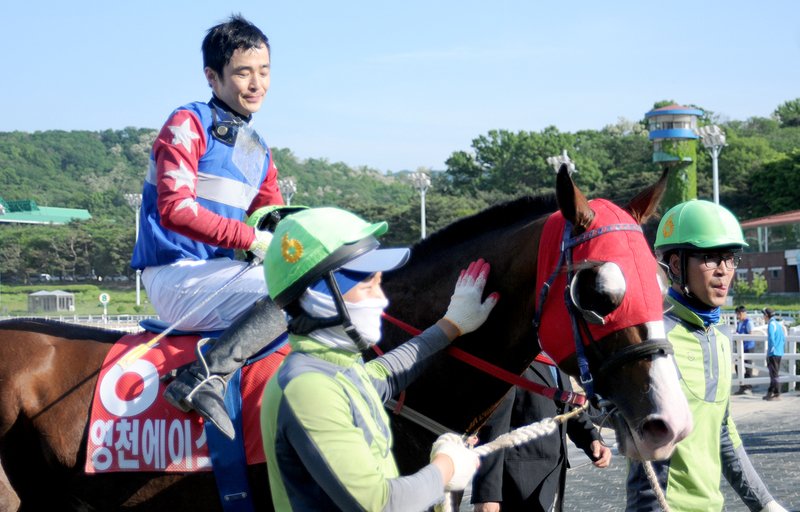 Cheonmang was winning his fourth race on his tenth start and it was a first big race win for up and coming jockey Lee Chan Ho. In other races on Sunday, down at Busan Rock Band maintained his 100% record with a very easy class 4 victory over 1400M. The full brother of 2013 President’s Cup and Grand Prix Stakes winner Indie band, the three-year-old Rock Band (Ecton Park) moved onto four wins from four starts. 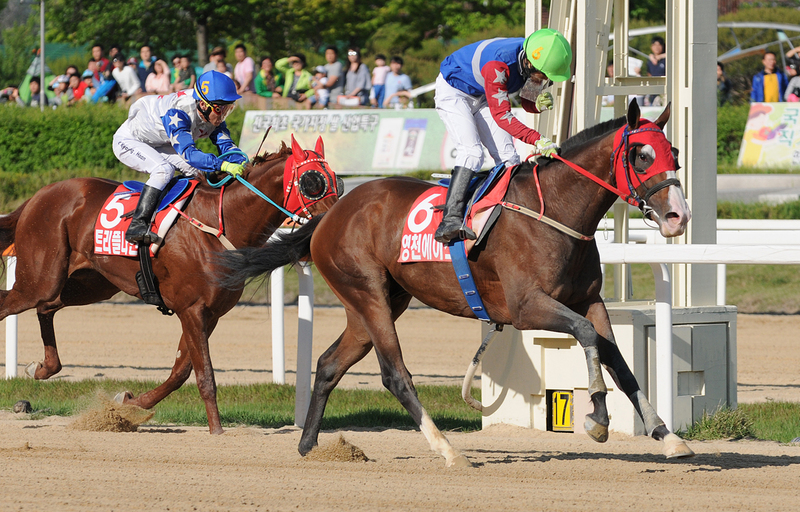 This coming week at Busan, Cinderella Man is set to have his first start since moving to the Bart Rice stable. He is set to take on Gyeongbudaero, Nobody Catch Me and Spring Gnarly in what looks like yet another ultra-competitive class 1 race at Busan. Meanwhile it’s “Trainers’ Week” at Seoul and Sunday will see the running of a “Trainers’ Cup”. So the Derby has been and gone but we’ve plenty to keep us occupied this weekend, including a small but ultra-competitive field for the Gold Circle Trophy at Busan on Sunday. Only eight run in what is without doubt the feature race of the weekend but they include the unbeaten pair of Diferent Dimension (complete with deliberate spelling error) and Seoul Bullet as well as the highly promising Macheon Bolt, who comes in having won his past five races. They are joined by proven winners Vicar Gold, Yeongung Champ and Champ Line for the 1600M race. Seoul also hosts a big race on Sunday afternoon when a full field of fourteen will contest the Herald Business Cup over 1400M. Like the GC Trophy, it is open to horses rated up to 105. 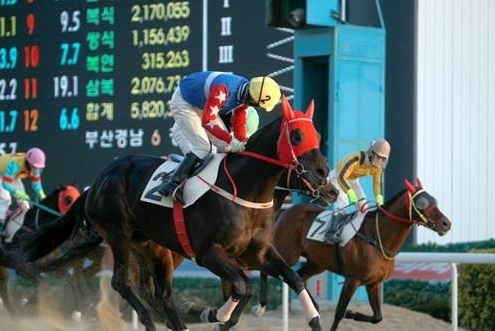 Two jockeys from Mauritius have arrived in Korea and are set to begin riding as soon as this coming weekend. Niven Marday will be based at Busan while Rakesh Baugheerothee will be in Seoul. Niven Marday gets arguably the easier assignment at Busan where foreign jockeys have tended to enjoy more success. The 25-year-old trained at the South African Jockey Academy and in 2014 rode six winners at Champ De Mars in Mauritius, finishing 19th in the Jockey Championship. He lies in 11th place this year with 3 wins so far. A couple of months ago, there were no foreign riders at Seoul. South African Jarred Samuel then joined in April and was quickly followed by Italian licensed Serbian jockey Djordje Perovic at the start of this month. Bringing the number to three is Rakesh Bhaugeerothee. Like Marday, the 38-year-old Baugheerothee also rode six winners in Mauritius last season and has added another one this term. At Busan, Marday joins the Japanese quartet of Joe Fujii, Nozi Tomzawa, Masa Tanaka and Nobuyuki Oyama.